HOMEGROWN PRODUCE sold in the market begins with sweetcorn starting mid July-September followed by peaches & nectarines (homegrown depending on availability) mid-July to mid-September. The earliest homegrown apples are ready mid August and are available throughout the winter. Occasionally, we will have our homegrown blackberries (most are sold through Pick Your Own). Our homegrown plums and pears are available in September. LOCAL VEGETABLES grown by the Amish include onions, tomatoes, zucchini, squash, cabbage, broccoli, Brussel sprouts and more! Locally grown salad and herb bowls are available in the summer and early fall. 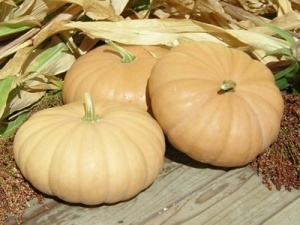 Starting in mid-September there’s an abundance of winter squash and various kinds of pumpkins. In October we carry Ohio chestnuts. HOMEMADE Cider, UV light treated with NO preservatives is available once our apples are ready. You’ll find ciders made from a blend of apples, as well as HONEYCRISP cider (limited supply). Late October we will have our award winning GOLDRUSH & EVERGOLD ciders. 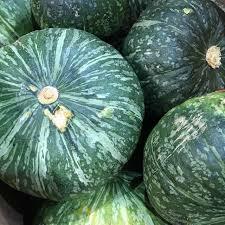 #1 selling winter squash, the Acorn has a sweet/nutty flavor with a beautiful orange flesh. It is a bit fibrous. 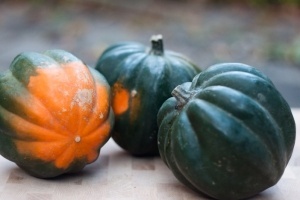 Blue Hubbard has a nutty, sweet flavor similar to a sweet potato with a hint of pumpkin. 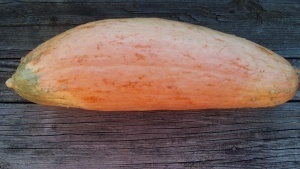 It has a deep orange color flesh. 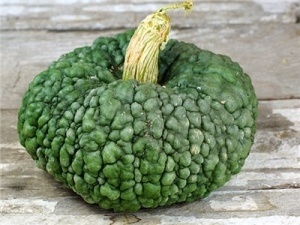 Butternuts have a deep reddish orange flesh with a distinct rich, nutty flavor. Very dense and smooth they are very popular. The ‘Pink Banana’ is delicious, dry, sweet, smooth orange fleshed. Choice of the South for pies! 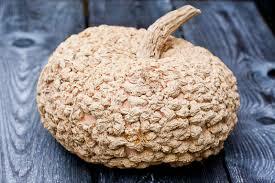 A type of acorn, the Carnival is a bit more fibrous, mildly sweet with a hint of nutty flavor. 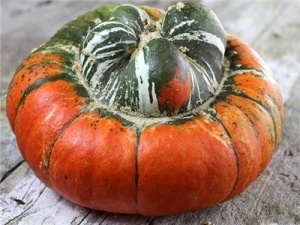 This French Heirloom is considered a gourmet choice with its deep orange, sweet, fine flesh. 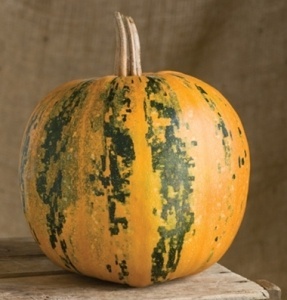 An Heirloom cross between a Red Hubbard and a Pumpkin, this ‘thing’ has a wonderful, sweet stringless flesh and is very versatile. Excellent for sweet quick breads, pies, soups or roasted. 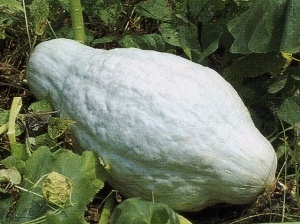 Known for its spaghetti- like strands that fall off the fruit when cooked. It is a great substitute for pasta and can be served with sauce. It can be baked, roasted, steamed or microwaved. 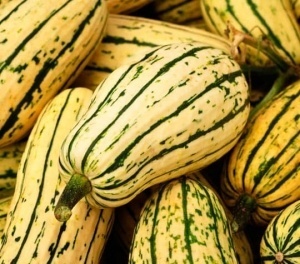 A “Culinary delight”, Speckled Hounds have a thick, dry, dense flesh that is remarkably sweet with a nutty flavor making it an excellent choice for roasting and for soups. This Native American Heirloom, often referred to as ‘Tennessee Sweet Potato” has a sweet, superior taste and is often used in pies. 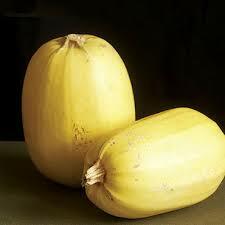 This ‘Sweet Potato’ squash has a delicate, creamy, sweet flavor. An ‘easy cooker’, it’s normally baked, but can be microwaved, sautéed, or steamed. Mitch Lynd’s favorite! 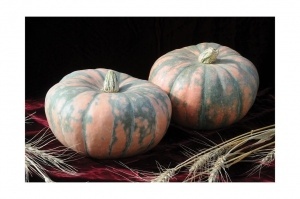 This French Heirloom ‘Musquee De Provence’ has a rich brown skin with deep orange, thick flesh. Very sweet and smooth – a favorite of chefs! Excellent for pies and custards. A large heirloom cross between the Blue Hubbard and Cinderella, the Jarrahdale has sweet flesh and is an excellent keeper. Makes a superb pie pumpkin. Avg. weight 12-18 pounds. 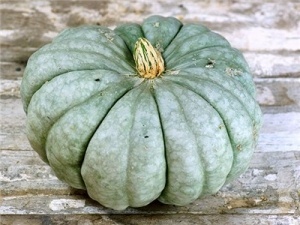 This small Japanese Heirloom is a bit dry, thick, dense and very sweet. Average weight is 3 lb. Kakis are known for their hull-less seeds making them an excellent choice for roasted seeds! Just scoop seeds, rinse and roast in oven till slightly brown. Otherwise, flesh is tough therefore making it NOT a good choice for cooking. 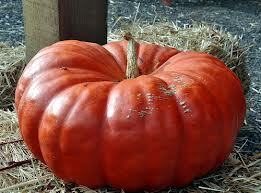 “Turk’s Cap” is a French Heirloom with a fine, thick orange, semi-dry flesh. It has a rich, nutty flavor and stores well. Normally roasted, mashed and then stuffed in it’s own ‘bowl’! 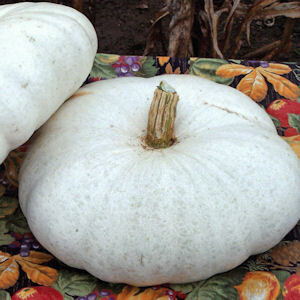 A south African Heirloom, this large, flat beauty can be grown to 30 pounds! 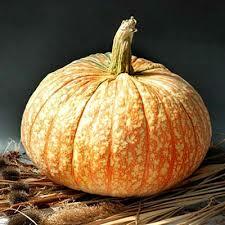 It has a very firm, sweet, orange flesh and is popular for pies. 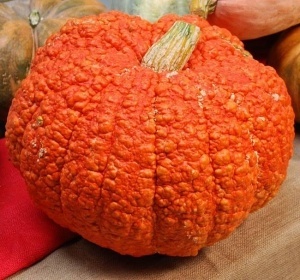 This heirloom is considered a gourmet cooking pumpkin. Peanuts on the skin are a result of excess sugar built up in the skin. The more peanuts, the sweeter the flesh! 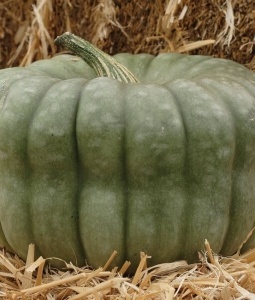 One of Lynd’s top selling pumpkins, this heirloom is sweet with fine flesh and a good keeper. This Italian Heirloom has a rich, sweet flesh and is a good keeper. It’s considered very good for soups, baking and pies. 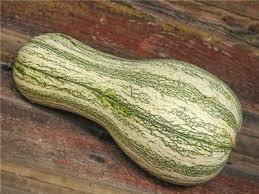 This Pennsylvania Dutch Crookneck Squash has a superb, rich flavored, deep orange flesh. An Amish favorite for pies, butters and desserts. 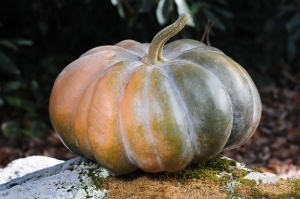 This hybrid is a popular decorating pumpkin known for its resemblance of a bloodshot eyeball, hence the name! Not used for cooking. 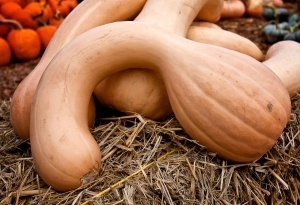 This hybrid has a deep orange, sweet flesh and is very good for pies & soups. 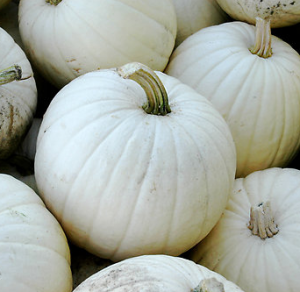 Pumpkin growers give a % of their proceeds to benefit Breast Cancer research. 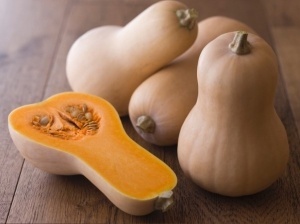 This Australian Heirloom has a dense, sweet, fine, deep golden flesh. 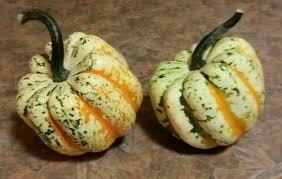 Very good for baking, soups and pumpkin bread. 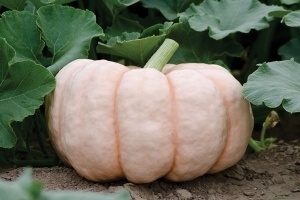 Luminas are very popular for painting and carving as the bright orange flesh contrasts beautifully with the white skin when carved. Not known for cooking. LYND brand items include jams, fruit butters, fruit salsas, variety applesauce, flavored ciders, BBQ sauce & salad dressings. In the bakery you’ll find fresh pies from Steven’s orchard (delivered every Friday morning) and Amish fry pies. Hershberger pickles, Brother Vets mixes, Cooper Mills sauces, Fowler Mill baking mixes, Harv’s Honey, Bonhomie Maple Syrup, LR Beef & Nom Nom dog treats are some of the Ohio made products you’ll find at our market. Troyer Trail Bologna, sausages, and a wide variety of cheese can be found in our deli cases. If you’re looking for a LYND Fruit Farm souvenir, you’ll have lots to choose from! Our popular Lynd garb is stylish, affordable & super comfy! Back by popular demand we will feature our LYND purses & bags made of a rugged canvas which were a hit when introduced in 2017. New 2018 will be a Lynd puzzle – one for all ages. Home décor, stuffed animals, children’s farm books, Spookley pumpkins, Swan Creek Candles, Martha’s Milks Soap & doggie items are just a few of the gifts you’ll find in the Northeast corner of the market. With the addition of heat in our market, we will now stay open through Dec. 15 for the Christmas season. Custom gift baskets, Christmas décor, and activities (to be announced) along with Christmas trees for sale will make Lynd’s a holiday stop you won’t want to miss!